Fair Trade Judaica worked with MayaWorks to design the first tallit, woven in shades of blue and turqoiuse in the fall of 2009, the first shipment went on sale in the U.S. in January 2010. Over the past two year,s the colors have expanded to include red/brown stripes and one with rainbow colored stripes. 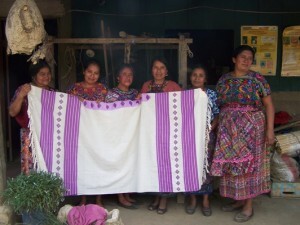 All of the tallitot since the first one have been woven by Lili Carmen Osario of the Tzanjuyu group in the Guatemala Highlands. The demand for these tallitot is now greater than what Lili can weave herself, so at the end of April, she traveled from her home in Comalpa to the village of Xetenox and trained five additional women, Vicenta, Marta, Benita, Margarita and Santa, to weave the tallit. The Xetonox women were very excited to learn how to weave the tallit, and began by making their first sample of the new (soon to come) lavender tallit! The women were so proud about their accomplishment when they completed the first sample, they celebrated with a very special and delicious lunch! Lila was an enormous help and the women said they learned every minute detail from weaving the tallit, which is 36″ wide by 72″ long, to selecting colors for the stunning purple stripes and stars. Without Lila’s expert “weaving secrets”, the women no doubt would have struggled to learn to make the product. The women wrote all of the details of the weaving in their notebooks to retain the skills they learned during their training. Lila’s help with the training has not only taught the women to weave this product, but has helped better their weaving ability in general! The women are extremely grateful to receive this training from MayaWorks! MayaWorks purchased the loom equipment needed for three sets, for about $125. For now, one loom is prepared, and Lila will return to help the other women set up their looms as well.